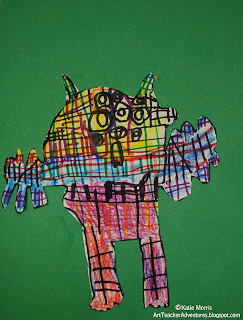 The inspiration for this lesson came from Joanna Davis at We Heart Art- Organic Shape Monsters. I love (LOVE!) her idea of using yarn tied in a not to teach organic shape. I pinned the idea for the yarn, intending to do something different with it, but my 1st graders and I were kind of on a monster/wild thing kick so it stuck in my head! I do try not to look at many photos when I'm planning that way it's easier to kind of put my own spin on it. Not that there is anything wrong with not spinning, or that I really spun this one all that much. Each student got a piece of yarn that I had already tied in a knot and moved it on their paper until they got an organic shape that they liked. They traced with pencil then added details. 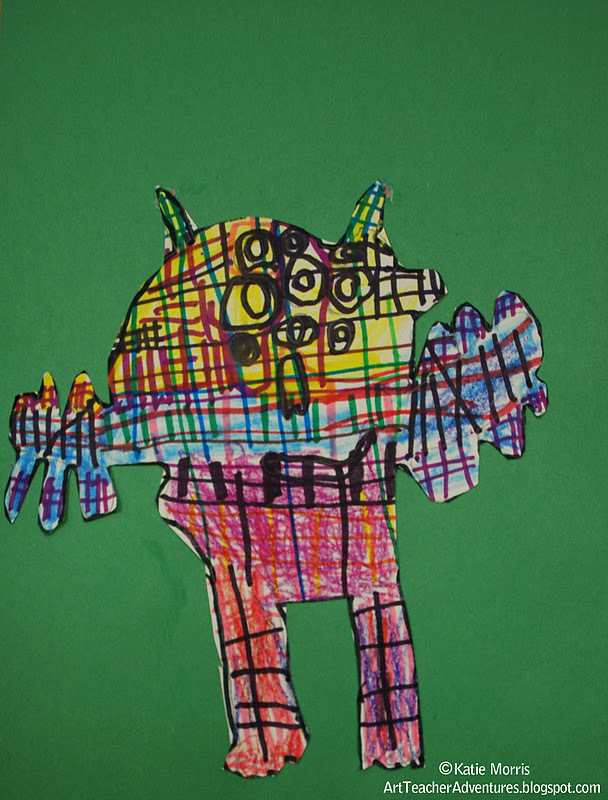 I told them that their monsters had to have a mouth and at least one eye, some sort of pattern, and a way to get around (does it walk, fly, swim?) After planning in pencil, the students used markers to add details. I always have to remind the students to use the right size tool for the job. I put out regular size markers for coloring in big areas and skinny markers just for tracing lines and adding little details. 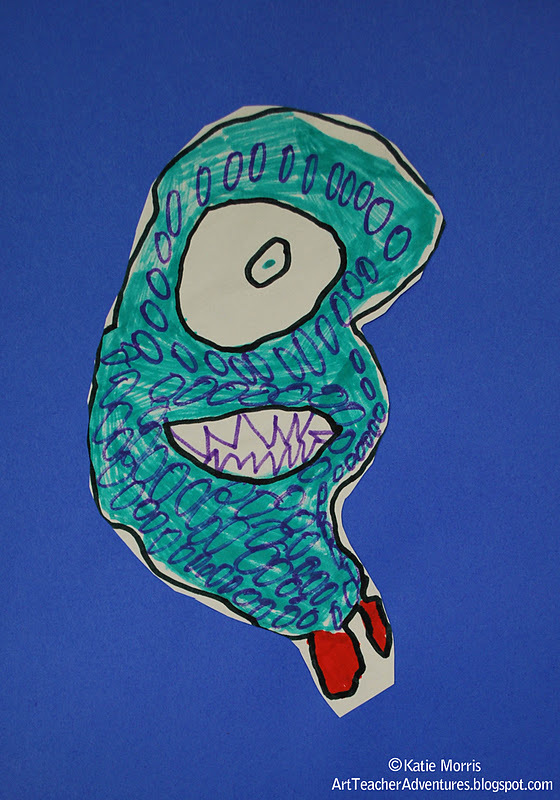 Of course you'll always have a few students trying to color in their whole monsters body with a teeny tiny marker. I like to just hand those students a marker of the right size and walk away. 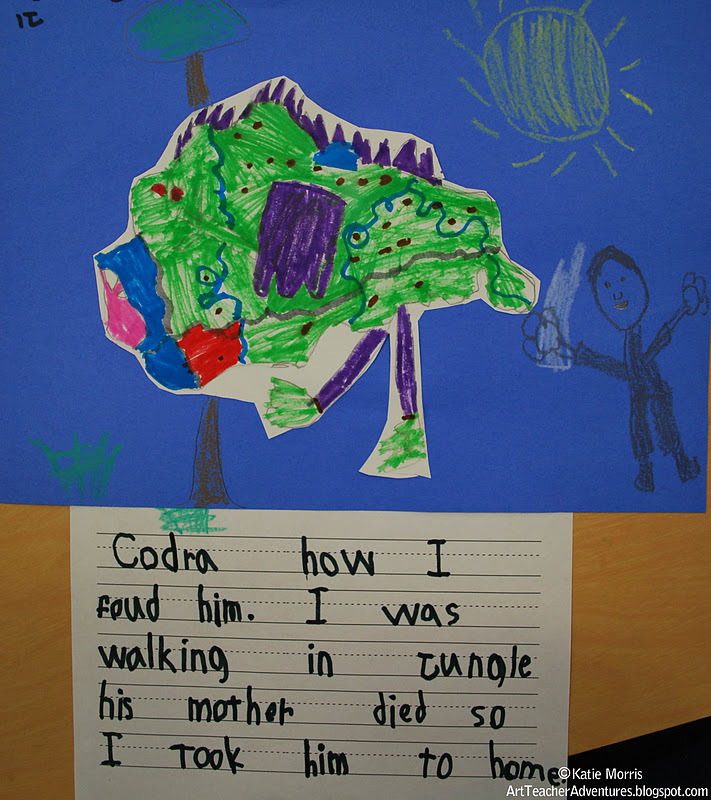 After carefully cutting and gluing, I asked the students to write a story about their monster. If they needed more prompting, I asked them to tell me their monster's name and something they like to do. I printed off a half sheet writing paper template so they would have the lines they are used to writing on. 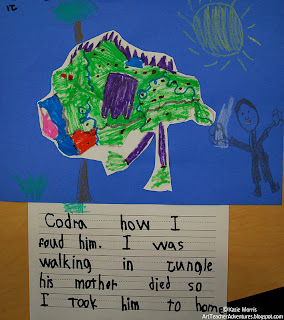 When the writing was finished, I taped it from the back so their story is visible below their artwork. Students who were super speedy added details to their background with construction paper crayons. Or markers if I didn't notice in time! I think the story was the most interesting part of some. I have some leftover writing paper that I held onto for future lessons because it made their writing so much easier to read. I pinned and used this lesson too, a while ago. Isn't it great that we can share such fun easy ideas? Yes! This is such an easy way to make kids understand organic shapes.